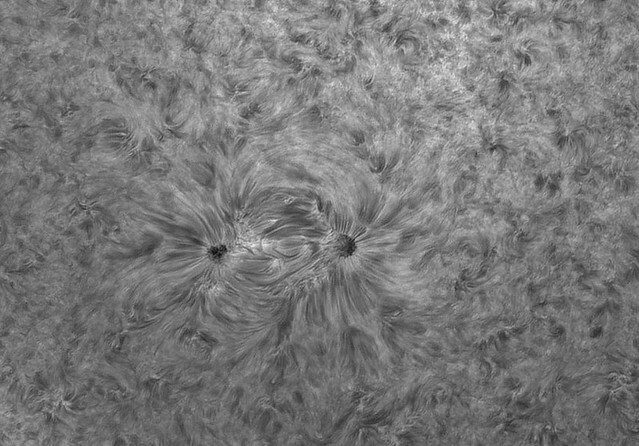 H-alpha 30092018, first light asi290mm - SolarChat! Bought a new camera, the ZWO ASI290mm. ZWO confirmed that the fact that it has a rolling shutter does not affect its capabilities of H-alpha imaging. + Compared with the PGR 174, I don't need a 2x barlow to achieve the same image scale. + A lot of light to work with, quite sensitive! 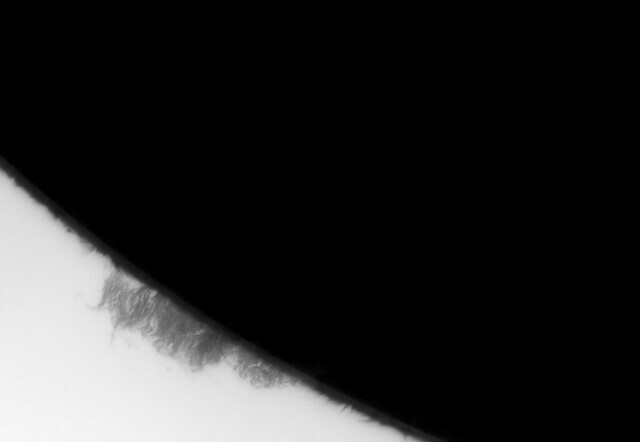 + imaging without a barlow and a wedge makes everything a bit easier. Less reflections etc. - FPS is lower than with the PGR. 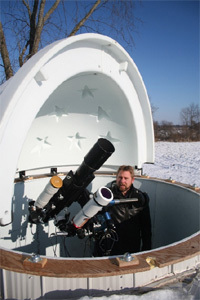 160mm D-Erf - 150 mm f/8 SW - 1,25x Glasspath - Baader 35nm H-alpha - pst etalon - Lunt BF1200. Took out the blue glass of the Lunt BF1200 and tried again. Wow, that is a whole different ballgame. Exposure of about 0,3 ms (!). If I up the gain, artefacts appear, so it is a bit too fast. Have a ND0.6 filter on the post, but today worked without it. Between 1,0 - 1,5 ms is what I will be aiming at. Two examples, not the best, but the best I could manage under these circumstances. Interesting camera! Last edited by bart1805 on Sun Sep 30, 2018 6:06 pm, edited 1 time in total. Great results with beautiful details, Bart ! I was out this morning shooting AR2723 also.... still processing images. Thanks Franco, curious about your results! Thanks Apollo. Hope to be able to make an animation before solar season is over for me. Next time will also try with the lens piece of the Baader Q-turret barlow in the nosepiece of the ASI. Will result in about f/14. Curious if Newton Rings will appear. I very much like the soft processing of your first image, Bart. For a first image with the new camera I think it it incredibly good ! Baader D-Erf. It does exactly what it should do. Congratulations on your new instrument and great first results. I had some questions about your BF mod and the camera itself. Is the blue glass on the telescope side of the BF1200? I can tell that the glass on the camera side of the BF1200 the glass is red on my BF1200 but I can't see the glass color on the telescope side or whether it's in an internal location. I want to know because I'm looking for ways of getting faster shutter speeds on my high res setups. I only do imaging with no visual work. On the camera sideyou are looking at the blocking filter. I can see that pattern when the exposure is very, very short. 0,3ms is very fast. On the dangerous side I would say. So will try out the ND0.6 filter. Thanks, should have mentioned that, don't do this if you go visual. It seemed to be a much bigger reduction than 50%. Will put it on the "check it next time list". Using a Baader D-ERF up front and a secondary mini ERF another Baader ERF I think gives more “protection “ than the original blue glass filter element. I was very aware of potential eye damage in removing the blue glass. I only do imaging since in my area good skies are very rare. for photographic use only. The 50% reduction in Ha quoted above with the blue glass in place suggests much less than that when the blue glass is removed. My shutter speeds, especially when double stacking, are in the range of 15 to 25 ms and that is often with gain turned up. So, when I hear that some people are achieving 3 - 5ms, I want to know what they are doing to reach these fast speeds. I know some rare PST etalons are very bright and give very uniform results by the two I have are not in that category. @Lou: your pictures of 15 august were taken with an exposure of 15-25 ms? Gamma at neutral? 3-5 ms for DS H-alpha is something I was never able to do with the PGR camera. Will try it out with the 290MM. The August 15 images were taken at 25 ms (25000µs on the settings for my Blackfly S) with both gamma and gain turned up. I used a Lunt152 + a Quark Chromosphere working at f/25. The scene had bright highlights. The 3 - 5 ms shutter speeds I was referring to were for single PST high transmission etalons as you seem to be using. Hi Lou, how high is the QE of your camera at the H-alpha wavelength? I think it could be way lower than the QE of the 290mm. CS! Bart. I have used my 290 on a limited basis on the shorter focal length scopes to match the pixel size. It is primarily used on the C14 for planetary imaging...nice resolution with no need for barlows! Trying to interpret the QE of the CMOS chips is a hassle...they tell us the wavelength with the maximum sensitivity and show the response curve with the most sensitive set as 100% . It is more useful when they tell you the QE of the most sensitive part and you can do the math form there. I always liked the absolute QE data supplied on the CCD's.